Welcome to Plant Centre Manager’s (PCM) first blog. ‘Musings of a Plant Centre Manager’ is a new gardening blog and will be posted monthly. PCM will focus on which plants are looking good now as well as jobs to do. PCM welcomes any feedback and indeed any views on plants and gardens. For many, a new year allows a fresh start and yet it is easy for thoughts of the garden to be cast aside. However, there is still plenty to do to which will also help burn off a few of those Christmas calories! 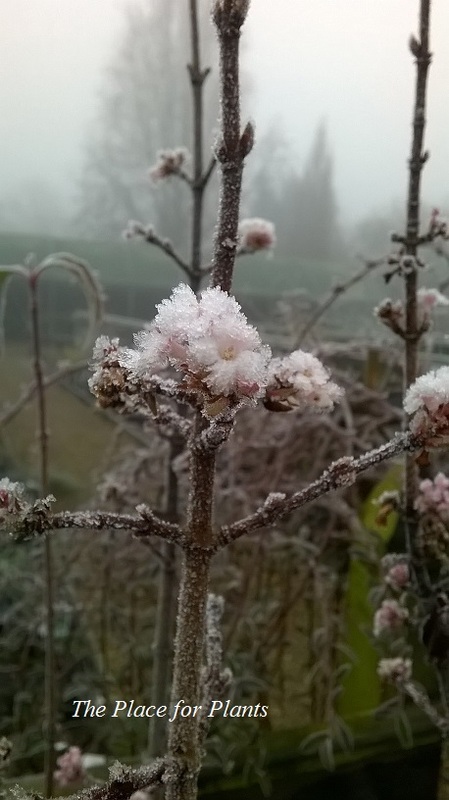 Now is also a good time to blow the cobwebs away and visit the Plant Centre. There is fantastic range of plants for winter interest available. Our first gardening thoughts are usually on colour. The bright winter stems of Cornus look wonderful in these cool cloudy days. However, scents should not be underestimated and PCM particularly likes the sweetly scented winter flowering Viburnums. Right now, Viburnum ‘Charles Lamont’ and ‘Deben’ are budding up nicely. Or try Viburnum farreri for an earlier flowering specimen. Viburnums are surprisingly hardy shrubs and ideal if you have an exposed garden. They are easy to look after and tolerate pruning (after flowering) so can be grown in all gardens. Viburnums are one of those plants that always encourages PCM out into the garden, even on bitter days, to have a good sniff of that shampoo scent. If you like your scents a bit more spicy then you cannot beat the scent of some Hamamelis (witch hazels). Hamamelis generally flower from December to February, depending on their location. If planted in a more sheltered site, Hamamelis start to unveil their bright delicate spidery flowers from December onwards. However in a more exposed position flowering may be delayed until January. 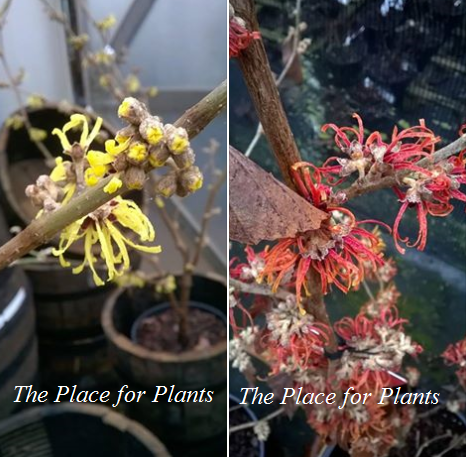 A lot of people think that Hamamelis are difficult to grow. However, as long as the plants have a good fertile soil which is neutral to slightly acidic then they perform really well. Plants Above: Hamamelis × intermedia ‘Pallida'(AGM) and H. × intermedia ‘Jelena'(AGM). Hamamelis make fantastic container plants for the shady patio or terrace. Be careful not to allow them dry out in July and August when the flowers are forming. PCM always prunes containerised Hamamelis in spring (March/April). Reduce this year’s growth by a third and remember to prune to an outward facing bud. Correct pruning will encourage side shoots and keep the plant from producing crossing branches. You can have a plant of 1.20m (4ft) covered in flowers for a good month or two if pruned correctly every season. There are so many varieties of Hamamelis to choose from but PCM’s favourites are ‘Pallida’ with wonderful rich scent and spidery sulphur yellow flowers; ‘Jelena’ with rusty orange-red flowers which have long delicate petals and ‘Vesna’ which is a bit of a mixture of the two having yellowish-orange tinged flowers and a slightly more upright habit. Tree Pruning– now most of the trees have shed their leaves you can see their structure. PCM always has a good look at the trees in his garden. Look out for any rubbing branches that could be removed. Consider the general outline of the tree and prune lightly. PCM has got carried away before so remember to keep stepping back to assess! Some trees bleed sap if they are pruned too late in the season such as Acers and Betulas. PCM always prunes these trees as close to Christmas as possible. This gives them time to heal before the big rush of sap that they have in spring. Always use sharp tools and sterilise them between plants. Shrub and Bush Rose pruning – these can now be pruned to reduce wind rock (plants being rocked out of their root system by wind). Shortening the stems back to half of this year’s growth can reduce this risk significantly. Dead Leaves– rake and sweep these up and put them in a separate area to your compost to make leaf mould. When this is composted (next year) it will create a great additive to your compost and makes good mulch for those woodland plants. £15.00 per person (RHS members £13.00). Join Rupert for a tour of the garden, please wear stout outdoor shoes as paths can be slippery. Happy gardening and all the best for 2017.